Big news! You may have noticed that some things are different around here. We’re excited to finally get to share with you what we’ve been cooking up. 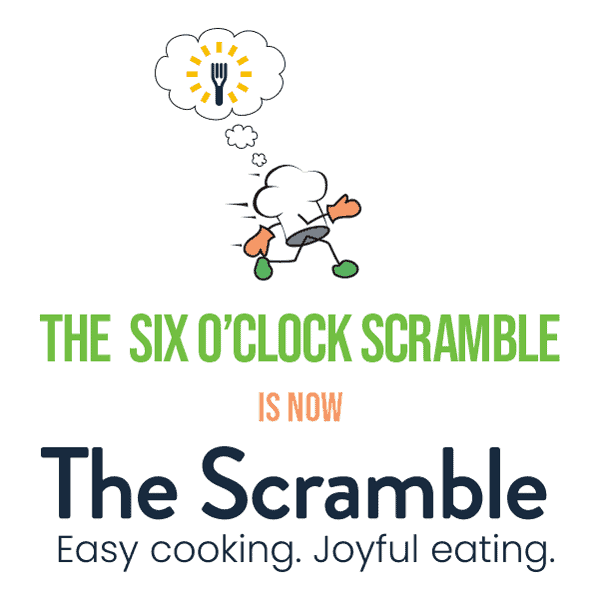 The mission of The Six O’Clock Scramble has always been to help make healthy family dinners happen. To us, that means taking the stress out of dinnertime together by providing families with the resources to do so. We believe that cooking should be relaxing, not a scramble to get dinner on the table by 6 pm. After all, the key is togetherness, not timing. Before taking over here in 2017, I was a personal health and cooking coach passionate about helping families raise healthy eaters. My personal mission has always been to show families that cooking can be accessible and even fun when you’re equipped with the right skills. So, when the opportunity arose to have a much larger platform to share this message, the career move was a no brainer. This is a message that I’m still passionate about today and one that is the ethos behind our new brand – The Scramble. We simplified our name to better reflect the vision that continues to drive us forward: that food should be savored, enjoyed, and shared, rather than restricted, avoided, or argued over. Our new website and logo were designed with comfort in mind; we wanted to create a virtual space that’s calm, cheerful, and welcoming to visitors. So, aside from our branding, what’s changing? First let’s start with what’s staying the same. We wouldn’t be who we are as a company without the weekly meal plans and grocery lists — they’re here to stay! Instead, we’re focusing our efforts on providing more resources to support the three guiding pillars to our revamped brand: planning, cooking, and eating. Outside of meal planning, we’re building out our offerings to include cooking videos, articles on kitchen basics, advice on how to build out meal plans, and much, much more. We hope to help parents learn how to deal with picky eaters, provide the right tools to overcome eating anxieties, and reclaim valuable time at the family table. The goal is to get to a point where we, as a population, no longer have to worry about fad diets and food trends and instead just enjoy simple, homemade, healthy food – together. To celebrate our new look, feel, and features we are also launching a sale! Use code NEWSCRAMBLE to get 30% off any membership, renewal, or gift! So, please, join us! We hope you like this new look, feel, and direction for The Scramble! Look out for more updates as we start to bolster our resource library and find better ways to serve the busy families everywhere. Thanks so much!! 🙂 I am super excited! Congratulations on the new brand Jessica!! And love the mission and the simplified direction. Can’t wait to follow along!